The last 12 hours has been grueling. I wouldn’t mind except for the discouraging fact that we’re going nowhere fast. We seem to be in a strange cycle that allows no forward progress. However, the same amount of effort is required on the pedals just to keep at a standstill. So how does my mind deal with these adverse conditions? I create lessons for my classroom drawing from my immediate experience here on the boat. Using our Classroom Expedition curriculum, my kids will draw on their prior knowledge of living space, location and daily activities transfering them abstractly to the Moksha Classroom. In this I will recreate Moksha’s real-life dimensions and outside environment. Kids will then have the opportunity to step from the world they know into a virtual one they know nothing about. Within this new world we will study the five themes of geography, directional headings on the compass, longitude and latitude. My thought is to create an experiential learning environment to keep an element of fun in each individual child’s learning experience. So, I’ve created a new game. When American kids go on holiday they play the license plate game as they travel, listing as many state license plates as they see. I have a British version for the Coral Sea called Fish and Ships. In this game you list as many as you find in the catagories. Moksha and I played this yesterday. Fish – 0. There are no fish in the Coral Sea. The water is far too wild and they’ve all emigrated to a better life elsewhere. The only marine life I’ve seen are a pair of Boobies that have been with us since Guadalcanal. Mr + Mrs Bird (intimately known to us as Mick and Stacia) visit us every day and report on sea conditions and what the weather’s looking like up ahead. Ships – 3. Its been interested to observe patterns in these three ships, the hull shape giving a few clues as to the craft’s possible function. This requires keen attention to detail and description. We’ve actually found this game to be a bit boring, but in an actual classroom setting children are only limited by their imaginations. Fatigue and salt sores are all the rage on Moksha these days. Fatigue was always going to be a problem on this voyage once it became apparent from the start that we’d need to keep the cranks turning to avoid being swept westward. We haven’t had even one hour off – let alone a whole evening like we’ve occasionally done on previous voyages – to do something completely different other than pedaling. The result of this rather grueling regime we’ve put ourselves under is that neither of us have slept for more than 4 hours in any one of the 13 nights since leaving. But tonight was going to be an exception. In celebration of crossing the half way point of the voyage we had planned to take off a couple of hours to cook a nice meal, listen to some music on the Moksha internal PA system and pretend we were a million miles away from the Coral Sea and all its delightful characteristics. But by 5 ‘clock this afternoon the seas looked even bigger than ever, and the thought of trying to sit somewhere comfortable enough to strum out even a few strains on the guitar started losing its appeal rapidly. So we’ve opted for postponing our big night out until the ocean calms down a little. I’ve finally figured out what the whole salt sore thing is about (finally, after how many days at sea now?). It all boils down to A. Wet conditions and B. Rotation of clothing/footwear. I got to thinking why salt sore have become such an issue so early on in this trip (both of our backsides are red-raw with little sores and April has a couple of hum-dingers under the straps of her sandals that have burnt through the layers of skin to the flesh) and yet were of no real issue to Chris and I throughout the last voyage. The only thing different on this voyage is the amount of time we spend pedaling in wet conditions, our wet skin rubbing against wet material that is rubbing against a wet pedal seat/sandals. So, without a copious resource of either dry clothes or fresh water to rinse the salt from our skin/clothes (which we obviously don’t have) the only other remedy that seems to work is rotating the shorts and sandals we wear to vary the friction areas on our rear ends/feet. Although fatigue becomes a 24 hour all over mind/body malaise with time, it’s during the night shift that it really gets to business on you. At the beginning of a shift you normally feel OK. Then as the hours roll by your head becomes heavier and heavier until it lolls hopelessly in defeat. At this point one part of your body (i.e. your head) has unofficially called it a day and gone to sleep. But there’s obviously a breakdown in communications somewhere down the line because what usually happens is the legs keep pumping away and you can continue like this for a good distance like some sort of zombie Energizer battery-bunny with its head cut off before the legs figure out what’s happened. Occasionally the mind suddenly wakes up, remembers what its supposed to be doing and snaps the head smartly into the upright position again. But this is usually a rather traumatic affair (as anyone who has fallen asleep at the wheel of a motorcar going 90mph will know) and if repeated too often in one night can leave the person with mild effects of whiplash. Rather than go for the recommended option of getting more rest, April, not wanting to miss out on even a minute’s opportunity to keep the boat moving forward to Cairns, has devised this clever contraption (see photo) to keep her neck and head upright whilst pedaling. This way the now official Moksha Energizer Bunny (she looks a bit like one too don’t you think?) can fall asleep at anytime and keep on going…for hours….and hours….and hours….and still look refreshed at the end of her shift. A couple of years ago Jason lent me a book called ‘Handling small boats in heavy weather’. 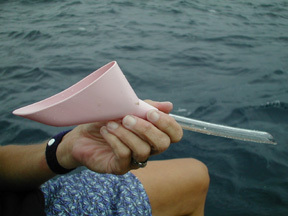 I have used it in my 5th grade class when studying oceans of the world. My kids have delighted in photographs of tiny boats under towering waves. Today I felt placed personally in those photographs. As of today, our ocean has been blessed with a 20-25 knot wind, which has really churned things up. Moksha has been like an amusement park ride out of control. This was made apparent while brushing my teeth this morning. I was leaning out of the hatch to spit. The boat had just crested a wave and I was looking 30ft straight down. Wide-eyed I sat down suddenly. “Yes” he replied calmly, “On the Atlantic”. His calm demeanor reassured me. I often use this same tactic when I fly. If I get a bit worried I check to see if the flight attendants are at all bothered. If they’re not, I figure it’s just not time to worry yet. Actually, powering this little boat over waves like these doesn’t leave a person much time to be concerned. All of your efforts are dedicated to pedaling full bore and maintaining the rudder ropes. My only regret is that I didn’t get to wash my hair yesterday and this wind is supposed to be around for another 2-3 days. Morale on the Good ship took an upswing early this afternoon when we switched on the GPS and found to our delight that the increased pedaling efforts of the past 24 hours had paid off. Yesterday around the same time we were looking at the same screen but with rather less to celebrate about. We’d lost huge numbers of miles west to the meagre few gained south, putting us on a collision course for the southern reef edge of Tagula Island only 45 miles away. Being exposed onto a lee shore - when the craft you are in is sandwiched between the wind and land - is not the most comfortable of situations to be in, least of all in a pedal boat with zero alternative means of power to get out of trouble. So we decided to channel our relative panic into miles made good: April upping her revolutions per minute (rpms) 30%, self 20%, whilst keeping to an aggressive course of 170M. So by noon today, although pretty shattered from our slog through the night, we found out we’d cleared the southern edge of the island and now have a clear run through to the entrance of the Great Barrier Reef at Grafton Passage, still another 500 nms away. 1. No one watching your efforts to open a tin of beans from the sidelines and uttering “You don’t wanna do it like that” every 10 seconds. Having two males in such a tiny space, both who each think their way is the best way, is not always such a good thing. In fact it’s very often a wind-up. That’s why God invented big open spaces like Iowa, so every man can do it their own way. 2. Although not as physically as strong in the legs for example, your average female has an unparalleled threshold for discomfort – or at least this one does anyway. Watching April extricate herself from the warm cocoon of the sleeping compartment (VOLUNTARILY I might add i.e. doesn’t have to be driven out by banging a saucepan in her ear like everyone else) only to be immediately soaked by an incoming wall of water over the port side before wrestling on a pair of saturated socks that have been swimming around in the well of the boat for the past 3 hours – and all without a murmur of complaint, let alone the to-be-expected deluge of ear-singeing diatribes too shocking to be shared here – makes for a truly inspiring display of stoicism for the rest of us blokes to follow. My top two least favourite things about having a woman aboard. 1. Hair balls in the curry. In fact hairballs with everything; in plates of food, wrapped around the pedals, caught up in the fan, stuck to the GPS, inside my bag of M+Ms (still unopened) etc. 2. Being rhythmically slapped in the side of the face by barrage of wet bras and knickers hanging to dry on the inside of the boat. The Coral Sea’s moods are proportionate to my pedaling plans. 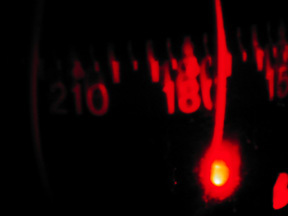 Upon leaving Tulagi I struck a relaxed pace of around 30-40 rpms. This coordinated with my training in which I strove for endurance over intensity. Any time I practised at 45 rpms it was for a relatively short time. In the last 12 hours we’ve calculate a new variable into the picture. The reefs surrounding the islands of Rossel and Tagula of the eastern extent of the Louisiade Achepelago pose a new threat. We are now dealing with a strong north west current that pushes us ever closer to the reefs. Coupled with a strong south easterly that is forecast in the next day or so we’ve had to take more aggressive pedaling measures to ensure we don’t find ourselves being exposed on a lee shore. I am trying to increase and sustain rpms of around 45 while Jason is upping his from 45 to 55. We finally got our break about 24 hours ago in the form of the wind backing further up the compass to ESE from SE and at times today even east, allowing Moksha’s nose be held at a more or less constant due south. The resultant 25 miles pedaled south and as many west has put us back below the black clearing line for Cairns on the chart (see pic) and in a favourable position to pass east of the islands of Rossel and Tagula on the eastern tip of the Louisiade Archipelago. (We’d have to work hard to end up on them now.) Along with the ESEasterly came a calmer sea and even occasional breaks in the cloud to give the sun a look in, making for (relatively speaking) paradise pedaling conditions. April even managed to get out on the rear deck without hurling and comb out her long, blonde hair. I’ve offered on numerous occasions to do her a favour (and for the rest of the crew living in a space where blonde hairs somehow integrate themselves into every aspect of life aboard) and cut it all off with the dividers (actually a pair of scissors). But for some strange reason she declines every time. Granted, the dividers are a little rusty. The salt sores are beginning already – a record for any voyage. This is undoubtedly related to the amount of salt-water exposure we’ve had in the past few days. We both have the beginnings of infected sweat pores on the backs of our legs, arms and buttocks. The next stage if we don’t tend to them is for them to flare up into full-blown boils – excruciatingly painful. 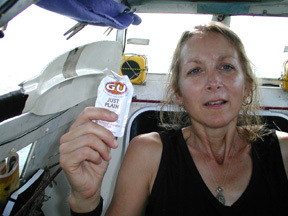 So we’ve been trying, in between bouts of being soaked by incoming waves into the cockpit, to clean and neutralise them with fresh water and Aloe Vera gel – another one of those miracle substances like duct tape that constitutes a must for any trip away from home. Everyone knows the important of psychological carrots, those little things that help us through the day. My life on Moksha has been quite demanding this past week and I’ve come to realize the importance of my own small psychological carrots. 1. Socks: the first few days I did not wear socks while pedaling and developed quite painful salt sores on my feet. As my feet have been constantly soaked in saltwater, the friction against the straps on my sandals has become very painful. Then suddenly I remembered the socks I’d bought to counter this sort of problem. They act as a buffer and suddenly pedaling has become much easier. 2. Magnifying lens: it is the worst, absolute worst for a person who has had great eyesight not to be able to see. It is imperative that I am able to follow the compass, as the heading we travel is crucial. In the nighttime hours a small red light is used to illuminate the face of the compass. For me however this creates total chaos. The numbers become a blurred mass of swirling red and I would either have to place my head-torch under it until the batteries ran out or constantly leave the pedal seat, scarfing my shins on the pedal unit on my way to the other end of the boat to read the damn thing. 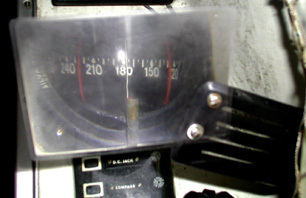 A simple, plastic $3.95 magnifying lens from Barnes and Noble – our local bookstore – stuck on the end of our now redundant cooking spatula (the pancake mix has all gone off) now allows me a clear view of the increments on the compass face and an incentive to pedal more confidently at night. 3. A dry bed: the past week has found my living space soaked in salt water, sweat and occasional rainsqualls. Moksha has taken on the look of a Chinese laundry as we try to dry out a few articles of clothing and towels. The occasional wave through the hatch has a tendency to soak everything inside the central compartment, including the pedaler. However, in the wee hours of the morning, as I come to the end of my shift, my wet tired body knows it will soon find relief in a dry bed. The little things in life…. Tonight marks the completion of the first week of the voyage, but neither of us feels like celebrating. For one we can’t afford to take more than a few minutes off here and there at least until we clear the reef system of the Louisiade Archipelago. Secondly, it has rained more or less non stop for the last 48 hours rendering living conditions aboard quite miserable (there is not one square inch of dry material on or in the boat – see video clip). We long for the sun, for even a hint of blue sky. A gap in the steel grey did appear about 3-4 miles to the east of us about an hour before sundown this afternoon, and our hearts lifted at the sight of it and the thought that we might soon be released from our watery prison. But cruelly the clouds moved back in again, swallowing us once more into the swirling pea soup that has been our home for so long now. One dilemma that I was wrestling with until today was how to navigate through the Louisade Archipelago reef system should we end up there without any detailed charts of the area. 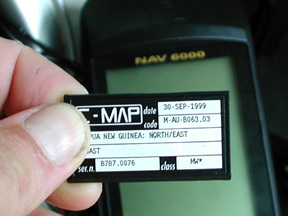 Then I remembered a rather extravagant purchase I’d made before leaving the US earlier this year of some C-Map cards that plug into our Magellan Nav 6000 GPS and provide on-screen charts that can be zoomed into for greater and greater detail on a particular region in question. Each card covers a fair sized region e.g. the whole of Indonesia, so what you are in effect getting for your $350 (for each card) is the equivalent of perhaps 50 or more paper charts but condensed into the size of single chip (see photo). 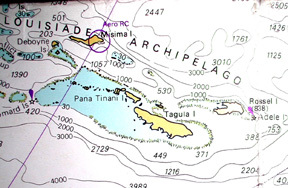 When I stuck in the card for Papua New Guinea and eastern Indonesia – that I’d got more for the kayak leg up from Timor to Singapore next year – I discovered with relief that the Lousiade Archipelago was just inside the outer eastern limit of the area covered. So now I feel a little more confident about nosing our way in and out of the reefs of that area if we have to. There’s another dilemma I’ve been wrestling with today also, to which I have as of yet come to no solution. Whilst burrowing in the front compartment this morning for some piece of long lost piece of kit carefully squirreled away in there sometime ago I came face to face with a large brown spider; a big wooly looking thing that fixed me for a few seconds with one of its beady black eyes before disappearing at a startling pace into the recesses of one of the food bins. Now I’m not one for spiders - can’t stand them actually. But I know April is even worse. Do I tell her about it and risk her not being able to sleep in there again for the rest of the voyage (unpacking all of the equipment and food mid-ocean is out of the question)? Or do I keep my mouth shut and hope she doesn’t find out for herself? Suggestions on a postcard please. It is the first day since leaving Tulagi that I have sensed some degree of routine to my day. My first week has seen quite a steep side to the learning curve; not made any less so by the sickness I believe I am finally beginning to get a handle on. As far as jobs to do each day, I am still restricted to those that do not involve my eyes being directed below the horizontal. So as yet – no cooking, navigation, emailing or bailing water from the bottom of the boat. How come I always get to miss out on the all the fun stuff? My only chore as such is pedaling, and we seem to have fallen naturally into a non-rigid 3-4 hourly shift pattern during the day and one longer stint each at night. This is in fact my favorite time of the day to pedal, from around midnight to 4 or 5 in the morning when Jason takes over until around 9 or 10. This seems to work for him, as he hates pedaling for more than a few hours in the dark, having a real hard time keeping awake. I’ve been taking great delight in watching the phosphorescence trail behind Moksha as she slips though the night, the moonlight playing on the water, the unfamiliar pattern of the stars – so very different to the hemisphere I am used to. The only other chore I accomplished today was washing my hair on the rear deck. And what a business it is doing ANYTHING on this boat! What started out in my mind as a 15-minute affair sooner developed into an hour and a half ordeal. It seems a whole different mindset is needed to achieve even the smallest things on board. Everything has to be planned in advance. With washing my hair for example, it wasn’t just a case of grabbing the shampoo and conditioner and leaping in the shower like I do at home. I had to visualize exactly all the things I needed before I left the cockpit: how I was going to transport them all to the rear deck with one hand free to hang onto Moksha, where to put all of these various bits and pieces once I was in position – so they didn’t end up rolling off the side into the drink - and then how to grip Moksha’s sides using only my thighs to relieve both hands for the task in hand. (At least I’ve had a bit of training for this last one – riding broncos back in Kansas!) By the time I was finished with all this I was totally exhausted and slumped into the sleeping compartment to recover. And as I lay there making a mental note to add at least 300% onto each task attempted in future, I realized my plan to wash my hair every two days might be a little over ambitious for now. OK, the fight is on. It seems that everything is against us getting to Cairns right now: the wind from the SE, the waves driving us driving back up towards the NW and the 1-2 knot current also heading NW. We had a bit of a break yesterday when the weather dithered around for around 12 hours giving us enough relief from the swell and wind to sneak 18 miles south. But since the trades have kicked back in full swing we’ve been struggling to make 1 mile south in every 3 hours. And that’s at a heading of between 180 and 200M, which has Moksha riding at a 45-degree angle against the waves. Its crazy stuff – never before have we had to make such an aggressive heading to get where we want to go. And that’s the problem. We have no choice in our destination it seems if we are to avoid huge penalties from Australian Customs and Immigration - Cairns being the only port of international entry on the NE Australian coast. But if we can’t make it we can’t make it. The main thing is we reach turf, and ideally Aussie turf considering we’ve taken a huge detour to dip south, pay a visit on our colonial cousins and hit our antipodal point for a legimate circumnavigation (it would have been a lot easier to have gone for China from Hawaii). The first battle we have in the next 3-4 days is to make it south of the Louisiade Archipelago, an extension of reefs systems running SE from Papua New Guinea. From there on into the main body of the Coral Sea the current is supposed – according to our pilot charts for the South Pacific that we use to determine probable strengths and directions of wind/current/waves etc during the planning stages of each leg – to head more westerly or even southwesterly at this time of year. This might make the difference between making it or not. As things stand right now we need to make one mile south for just under 2 west to make the entrance of the Grafton Passage leading through the Great Barrier Reef and from then onto Cairns. There’s definitely no leeway on this voyage. No margin for error. Every hour the pedals aren’t being cranked we lose about a mile and a half west. So April and I are pedaling 3-4 hourly shifts to keep the Good Ship moving around the clock. But its exhausting stuff, not least because of pedaling a 1.5 ton mass into 25ft swell and 20 knot winds. When we’re not pedaling we’re either catching up on sleep or fixing food. Not much time for washing hair either. “So as the first female aboard Moksha did you bring any feminine products?” the reporter on the satellite phone questioned. I smiled thinking of the makeup bag in the netting above the bed. Also the ‘Freshette System’ - an ingenious device designed to reconfigure the female anatomy for the purposes of peeing off the side of the boat while remaining upright – effectively reversing plumbing on the inside to plumbing on the outside the way guys get it. This suggestion came to me from my friend Nancy Sanford who has been with the expedition since Jason and Stevie stumbled ashore in Miami. The attempts to use this device on board today however have not been met with much success. The logistics of holding onto a wildly rolling boat with one hand and keeping ‘the device’ positioned with the other resulted in less than satisfactory aim and disastrous consequences. Every basic task is quite a chore with the constant movement of the boat. Thus far my two indulgences have been getting my teeth brushed and cleaning the salt-water residue from my face each evening. The thought of retrieving the makeup from the netting would be at least a three-barf trip considering my bout of seasickness the last 24 hrs. So my basic day consists of being on the pedals, eating a tiny bit when possible then climbing into the sleeping compartment until the whole process starts over again. So much for having a need for feminine products – just as well I left the cocktail dress at home. Poor April! Talk about being thrown in the deep end. From the little I've seen of the Coral Sea it's the most miserable patch of brine I've come across in Moksha so far. Ever since we rounded the western edge of Guadalcanal - Coral Sea Corner as April calls it - we've been pummeled by huge 20 footers that barge into the cockpit one after the other and widdled on from above by a seemingly endless grey sky filled with endless grey clouds. (A very different ocean to the one Chris I pedaled from Tarawa.) Consequently there is a semi-permanent reservoir of 2-3 inches of water sloshing back and forth over our feet that no sooner do I painstakingly remove fistful by fistful with our sorrow excuse for a sponge than another wave slops over the side to replace it. (Not before drenching me en route of course.) A particularly large one hit us at around three this afternoon having Moksha over at 45 degrees. Quite a wallop it was, managing to come in both sides of the cockpit at the same time. I knew this crossing wasn't going to be easy but these first few days are turning out to be a bit of an ordeal. And besides, this is no way to introduce a lady to the refined pleasures of deep water pedal boating. Pedaling during the day in these conditions is bad enough, but night time adds a whole different set of dynamics. One of the most frightening sounds on the ocean is the roar and hiss of a 'super-wave' cresting one or two wavelengths up wind. Every so often - and there's probably a pattern in it somewhere - one, two or three extra large waves will pop up in an otherwise fairly predictable sea state. You can hear the sound of them first, then feel the pull of the water from under the boat into the leading edge of the first wave at whch point it is possible to loosely gauge the strength and mass of the super-wave and the likely consequences once it hits. But there always a daunting feeling of unknowing - whether this will be the one that flips us over or just be another uncomfortable ride like all the rest. Both of us are still feeling a little queasy. April, after a bad night, started the day off well by managing to hold down a mug of brown rice and broth. But this afternoon she came unstuck from leaning over the side washing her hair for too long, and after a couple of heaves retreated back into the sleeping compartment. It's a miserable introduction to the ocean, but she's holding in there. Today has been better than yesterday, so we seem to be generally on the up. Another couple more and we'll be pulling faces at the 20 footers and frying chips for breakfast. The wave scored a direct hit landing in my face and filling my starboard ear with water. I should have figured that was the way the rest of the day would follow. I bounded from the sleeping compartment, grabbed the video camera and began filming Jason who was on the phone. Instantly a wave of nausea swept over me and I stepping back to the hatch and emptied the contents of my stomach into the water. This day was to be a night and day difference to the first day. Day one I was able to pedal my three hour shifts easily, film with the video camera and form assorted tasks on board. No problem. Today however has been spent lying flat on my back or at the pedals, my only other means of escape from seasickness. The Peaceful Ocean had come to play hardball! My day has been filled with inventing ways I can adapt myself to her playground. And after 12 hours of ceaseless pitching and rolling I might just see the light at the end of the tunnel. If not, it may be a LONG 4 weeks to Cairns! It’s around ten in the evening of this the first day of the final leg to Australia. I’ve quit pedaling for a few minutes just to thrash this update out. April is asleep in the front compartment having managed to force down a bowl of rice and stir-fried veggies an hour or so ago. Not bad considering she was hurling her guts up an hour before that. After a great morning in which she pedaled 4 hours straight from the wharf at Tulagi where we pulled away from at 06.40 hrs this morning, she had a few twinges of nausea later this afternoon, “Oooh, so this is what seasickness feels like!” (she’s never been on a boat before) leading up to a full blow out of just a couple of hours ago. But she’s a tough cookie is April. That’s one of the main reasons I asked her to join me on this leg. If she can handle the first 48 hrs, she’s good as home and dry. We’re a little sad leaving the Solomon’s. Luckily for us we can just walk (or rather pedal) away from the conflict that is only getting worse by the day and literally tearing the country apart. But most of the people we’ve made friends with in the last couple of weeks are being dragged down also. With businesses pulling out left right and centre there’s less and less money in circulation. People are heading back to their villages every day to eek out a livelihood for their families by farming the land. If the banks close, as they’ve threatened to do if any of their employees are harassed by the militia, and if the oil tanker doesn’t make it in with diesel for electricity, then the country will effectively grind to a halt and rewind back to the days of pre-Colonialism. Many locals are convinced their country is going down the plughole. Much of the reason for this doom and gloom came alongside Moksha this morning in the form of a patrol boat manned by MEF (Malaitan Eagle Force) militia with semi-automatics. Having heard of many stories of communication’s equipment and food being taken off other yachts, we quickly hid all of the cameras and other items of value and expected the worst as they pulled up alongside. But after a few quick glances inside the boat, looking for goodness know what, they waved goodbye and took off as quickly as they’ arrived. So, it really is time to get out of here. Once we round the western edge of Guadalcanal in about 4 hours time we should be out of the danger zone (an MEF boat with 5 men was taken out by an IFM bazooka attack two weeks ago not far from where we are now) and have a straight shot to Cairns. Then we can get down to the serious business of somehow getting this ship through the Grafton Passage of the Great Barrier Reef into Cairns. One thing I’m sure of, this isn’t going to be an easy crossing by any stretch of the imagination. I’d like to formally thank all the folks at the National Fisheries Development tuna depot on Tulagi who so kindly gave Moksha free wharf space for the last three weeks, and all the management and staff at Vanita Restaurant who bent over backwards to make our stay as comfortable as possible. The stiff bristle brush skimmed the nylon covering of the mattress, coaxing dirt from its surface. Rivulets of sweat coursed down my arms, running along my sides. I looked forward to the cool water from the hose when I would begin the 'rinse cycle' on this stack of laundry. Soaking nearby, in a tub full of diesel, lay rust covered tools, an attempt being made to dislodge the salt residue which had welded the moving parts. They were the next job on my list. Cleaning bits and pieces of kit from Moksha was my afternoon task. Close quarters without much ventilation, hot temperatures, coupled with a humid ocean environment had created a job requiring a bit more elbow grease to get items properly cleaned and in working condition. Finishing the sleeping pad, I had now plunged my hands into the diesel, selecting a particularly crusty open end wrench. "Hmmmm," I pondered. I could make short work of this with a wire brush. Jason, however, called to me from the other side of the dock, "I could use a hand with this wind generator, please, A." Placing the wrench back in its diesel bath, I walked over to the edge of the dock where a couple of sailors from a local fishing boat were watching Jason work. These were some of my 'new best friends,' which I had made earlier in the week. They had been an appreciative audience as I'd told them stories of Jason's travels, displaying their interest and commenting, "He's a brave man!" When I'd shared with them the fact that I was Jason's next pedaler, but I'd never been to sea, they were quiet for a moment. Eyebrows raised as what I'd just said soaked in, "Ohhhhh... he's a Very Brave Man!" They were a good lot, and throughout the week, had been quite helpful, cheerfully taking me through an accelerated course in nautical knot tying. Meanwhile, the job at hand was trying to figure out why the wind generator hadn't been producing as much power as expected over the last voyage. Jason was pulling it apart to check the wiring. I was holding Moksha close to the dock while he used an Allen wrench to remove the bolt holding the cap. A bit of unexpected chop in the harbor suddenly sent Moksha upwards. The Allen wrench was dislodged from Jason's hand and we watched in horror as it plummeted downward, missing Moksha's deck and landing in five meters of murky water. The two sailors had seen the episode unfold and their group had now swelled to ten, all bent forward over the water looking for the elusive wrench. Jason, meanwhile, had resorted to using a pair of pliers in place of the wrench, but in vain. He concluded the inevitable, a dive to the bottom in search of the rusty Allen wrench was the only solution. After rummaging around in the boat for his snorkeling gear, he made an unsuccessful first try, his mask filling with water at a depth of two meters. He surfaced to clear the mask and dove once again. I had noticed a sailor standing beside me, one who had watched with interest whenever I had been aboard Moksha. He'd appeared to be quite a shy fellow. He left the group of onlookers, then suddenly reappeared with a snorkeling mask. Diving off the dock, he immediately swam to the bottom, surfacing a minute later clutching the Allen wrench. The crowd of onlookers 'Ohhhhhed!' their approval. This diver's manner was matter-of-fact, however, as if to say, "If this isn't the right size, I'll go back down to get you another!" His grin, though, was from ear to ear. Jason and I laughed in delight at his talent. I was touched, not only by this man's selfless action, but also by the fact of having witnessed, once again, another example of how human powered this expedition truly is. We finished the wind generator and I wandered back to continue cleaning my diesel-soaked tools. "Ms April, if you were asked to pedal the boat on the expedition, would you do it?" Logan inquired. My fifth graders were in the midst of making their own paper from recycled paper pulp. We had just received letters from the kids at Dai Nippon Elementary on Tarawa and my students were creating paper to be used in their replies to their new penpals. Logan's question was one I'd never given much thought. I gured I'd be pretty useless, as I've never been to sea. My only prior sea experience was a 'virtual' one as a kid standing on the beaches of Padre Island, Texas Gulf Coast. There, I envisioned my life as a pirate sailing aboard a tall ship, wreacking havoc. I'd carried the dream a bit into my adult life, attempting to book passage on a barefoot cruise in the Caribbean. Another time found me applying to help crew a tall ship across the north Atlantic. Neither of the voyages materialized. Logan's question was not an easy one to answer. My first time to travel with the expedition was over land, and even though I'd never done anything like that, I figured if a person had any going around sense at all, one could make do in most circumstances. But, his question would make a good topic for discussion, so I opened it up to the kids, "If you were to travel aboard Moksha..." and a lively dialog followed. I was caught completely off guard when I was asked a few months later. This time, it was Jason posing the question, "Would you consider pedaling the leg from the Solomon Islands to Australia?" And this was not meant to be a hypothetical situation. "Holy cow... what kind of physical preparation alone would be required to attempt something like that," I thought. And that would be the easy part. Could I possibly cover all of the homefront bases to leave for two months from mid June to the end of August? It seemed to be a bit of a monumental task, and my practical side began to process all that would be needed. Then, a thought from out of the blue. I was transported back in time, standing once again on the sandy beaches of south Padre, envisoning the full rigger in the cloud formations above the Gulf coastal waters... "Hmmm," I responded thoughtfully. "Yes... yes, I just might do..."
Six months later, here I am, sitting aboard the Good Ship Moksha. I'm attempting to type this update on a small rocking boat that is tied to the dock. Yeah, it's a long way from the conditions of deep ocean travel, but I'm slowly working my way there. I've pedaled her several times around the harbor to get legged up. Today, my intent was to tempt the 'sea sickness gods' by staring at this computer screen, typing in time to the rhythmic sway in an attempt to create as much of the actual scenario as possible before we depart at week's end. No, I'm not a glutton for punishment, but want to get a feel for as much as possible before I untie the boat! As I boarded the flight from Port Moresby, Papua New Guinea bound for Honiara, Solomon Islands, I was surprised at the number of people on board. South Pacific news agencies had reported a lull in the ethnic tension on Guadalcanal, but it appeared to be an uneasy quiet. Yet, the flight was very nearly full and I perceived that to be a reassuring sign. I'd not been too anxious about the fighting as far as my arrival on Guadalcanal was concerned. I was, simply, anxious to arrive for the sake of reaching the conclusion of my seemingly endless connecting flights from Colorado. Earlier in the year, Jason had asked if I would be interested in joining him aboard Moksha to help pedal the Solomons-Australia leg through the Coral Sea. As I've worked with the educational cultural exchange projects for Expedition 360, I imagined this voyage, on a professional level, could give me a very unique perspective. In addition, our Global Learning Exchange activities with kids in the Solomons would be an essential link in our global network. And now, after several months of gathering kit, making travel arrangements and spending hours on a recumbent stationary bike, I was at last to meet up with Jason and Chris. As the plane began final approach into Honiara, my attention became focused on the island below. Dense vegetation covered the hills of Guadalcanal and small rivers cut a shimmering ribbon across the landscape. Quite a contrast to what I had seen a year earlier on Tarawa, which was my introduction to the South Pacific region. As the plane taxied to the terminal, I peered out the window, searching for two familiar faces in the crowd of islanders waiting to greet the plane. The heat and humidity encountered upon deplaning was a startling contrast to the winter I'd left behind in southern Australia two days earlier. As I walked across the flight ramp, Kenny Brown, our cameraman whom I'd joined in Brisbane, hollered, "There's Chris!" Looming head and shoulders above the locals, Chris waved a huge greeting as he and Jason made their way through the crowd. My excitement at seeing them was nearly overwhelming. It had been a long road to get me to this point and I sensed that the easiest part of the trip was over. The most exciting, exotic and arduous journey was about to begin.